Royal Bay Care Homes specialise in assured retirement living, providing quality care homes for the elderly and dementia sufferers. They operate nine residential estates spanning Dorset, West Sussex, Northamptonshire and Worcestershire. The owners found that as their portfolio expanded, their website was struggling to maintain contacts and therefore they were experiencing problems with renewals and lost emails. 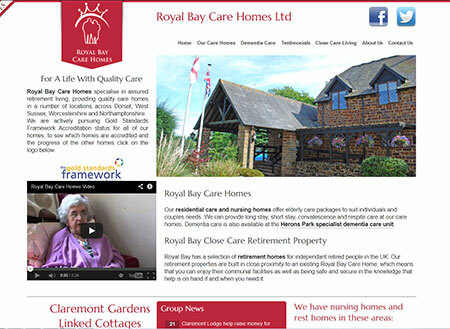 On top of designing Royal Bay a new website, Radikls has also been able to help maintain and manage the sites of all the care homes that the company manages. Radikls did this by consolidating the disparate domain names belonging to the websites of these care homes into one page, with internal links providing useful information and contact details for each. Radikls also included their net-inform package, which enables visitors to Royal Bay's website to view the latest news stories for the entire portfolio. This, coupled with a simpler email system and the attention given to Search Engine Optimisation, helped to produce a more user-friendly website that is simpler and easier to maintain. Radikls were also able to offer a competetive fixed-cost maintainence and consultancy package, which has helped to maintain stability and give the business peace of mind. Radikls is also continuing to improve the look and efficiency of the site, giving the dementia care page a more streamlined and accessible design, with a view to emulating this across the whole site.